Ask fellow campers about "Yellowstone Golf Resort" and nearby attractions. Cute Park in the middle of Hay Fields with an Executive golf coarse, very dry and dusty but nice just the same. 2 channels of OTA TV and WIFI only at the office. Our only complaint was being charged $50 for Friday and Saturday I believe their daily rate is $40 we had Passport America Sunday thru Thursday at $20, Friday and Saturday at $50 and $40 for the next Sunday then $20 for Monday because they were shutting off the water for the season. The Laundry room was very nice and the Bathroom was clean, the Park was very quiet mainly because there there few campers at seasons end. We would stay again but only at Passport rates $40 is a bit steep for this park. We camped at Yellowstone Golf Resort in a Motorhome. 60 miles to Yellowstone West entrance, 55 miles to Tetons. Mesa falls Upper and Lower were a nice day trip, also Cave Falls were very nice they are in the corner of Yellowstone park approx 30 miles from the camp ground, great hiking to several Yellowstone water falls from this area. Several rivers to fish and State parks to visit in the area. Aspen Grove camping in middle of the wheat and barley fields....and I mean in the middle. Friendly seasonal residents with lots of information on fun things to do. Sites were gravel but you had to go down the dirt road to get there; coach was dusty going in and out. Navigating the Aspens to get to your site was not a big deal. Fire restrictions for the first few nights in the camp ground. Trash in our fire pit with cigarettes the big offender. Our site #15 was a level one that backed up to our rear neighbor. Golf course looked like a fun time in your backyard! Wifi was only up at the barn but we sometimes got an intermittent connection down in the grove. Full hook up always a pleasure in Idaho, the land of dry camping. Lots of Nature to explore in the area, fly fishing the holy waters of the Henry's Fork is tops! We camped at Yellowstone Golf Resort in a Motorhome. Ashton had great Sprint service, whoo hoo! Fly shop/liquor store was one stop shopping in town. Cave Creek falls to the east was amazing. Upper Mesa Falls was a beautiful big waterfall, visitor center had really good displays of local wildlife. Clean park with lots of privacy. The staff is really nice and helpful. We had a military discount, as well as weekly rates. 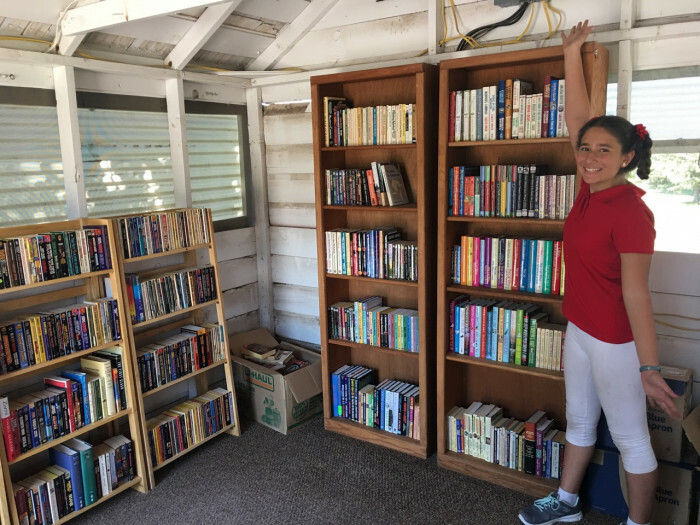 My daughter helped set up the library (for fun!) while we were there, and let me tell you, you will not see a bigger RV library than what is here. 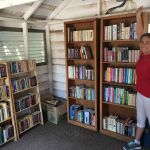 They also have games to borrow, 18 holes of golf, a playground, and more. Yet, it is quiet with incredible stars at night. 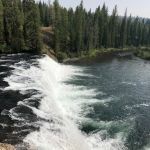 It is a bit of a drive to Yellowstone and Grand Tetons, but the price and proximity between the two made it a perfect place to stay. 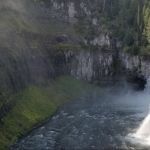 It is also near Mesa Falls, and the city of Idaho Falls. We would stay here again with no hesitation. We camped at Yellowstone Golf Resort in a Fifth Wheel. My space was very private tucked in a grove of aspens. The spring had been very wet so there was some mud to deal with buy did not present a problem. The golf course was rudimentary at best, but no doubt still recovering from the winter. Walked nine holes which was great after a long day on the road. I would stay here again. We camped at Yellowstone Golf Resort in a Travel Trailer. This is not a big rig friendly campground. The roads are narrow and so are the site entrances. The roads are either muddy with potholes or a dust bowl. They had plenty of gravel and machinery to put down the gravel in the roads and campsites but never did it the week we were there despite asking the owner in person to get it done. The campground is in some beautiful aspen trees and very quiet. The laundry room was always spotless. We camped at Yellowstone Golf Resort in a Fifth Wheel. This place is in the middle of nowhere. Yellowstone is 1.5 hours away. Grand Tetons over 2 hours away. Walmart in Rexburg is 30 minutes away. The staff here are super nice and go above and beyond. We needed a ladder to check the top of our pop out that had come loose. They not only loaned one to us but delivered it and picked it up. The sites are nestled in a grove of Aspen trees and choke cherries were coming on bumper crops. Many sites are private and there is lots of room between. We had full-hookup 50amp. Our site looked out on a beautiful wheat field and we were able to watch the sunrise every morning. It is very quiet and peaceful with no street lights to mar the evening sky. They have a par 3 golf course, which is very reasonable, only $10.00 a day for those staying. Was not crowded at all. There is no WiFi, but we have our satellite and had excellent Verizon service. Yellowstone Park is an hour away. The new owners are working hard to make this a great RV park. It is now called the Yellowstone Golf and RV Resort. 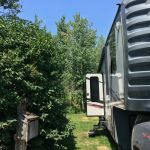 The sites are graveled and we had no problem leveling our 36-foot motorhome. We plan to return. All sites either had a fire ring. We camped at Yellowstone Golf Resort in a Motorhome. They have a nice 18 hole golf course. We don't golf but walk a lot and were able to walk 3/4 mile around the campground. The manager and staff were extremely nice and helpful. They escorted us to our campsite. There is a Family Dollar Store, hardware/lumber store, convenience store with a good supply of items. Small town feel with super nice townspeople. We are only 30 minutes from a Walmart if needed or only an hour from Yellowstone park. 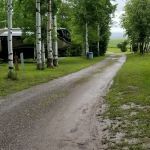 I chose this RV park due to the ratings and reviews regarding the Aspen forest and looked forward to seeing the campground. This is a tough park to review. I want to be positive but there are true negatives. Pros: Our site was level and deep which allowed us to park our 20' truck in front of our 37' trailer; our site overlooked a hayfield which we enjoyed; we had a large grassy area with a picnic table and a fire ring; there were trees of varying types and sizes to the rear of our trailer and between our site and the playground - our neighbor on the other side was in plain view. Cons: There was no circuit breaker to turn off the power when we plugged in our 50 AMP power cord; sewer hook-up, water and electric were in the farthest back corner of the site which meant we just had enough water hose and electric line to reach the connections. There was no way we could connect to the sewer. We didn't have enough hose and couldn't back up any further. We were told we could use the dump station when we pulled out. That was located off to the front of us so that would work. The biggest problem was the dump station...it was not truly a dump station, it just looked like one. We started emptying our black tank when the sewer line began to back up and overflow. There was no water spigot at the dump station so we had a major problem. Our raw sewage was spilling out onto the grass and we had no way to clean it up or correct the problem. A groundskeeper was already at our site racking and I went across to tell her what was happening. She apologized profusely and said they would take care of the clean-up. We emptied our tanks when we got to our next campground. Factually, you drive through a small aspen forest to get on the property. 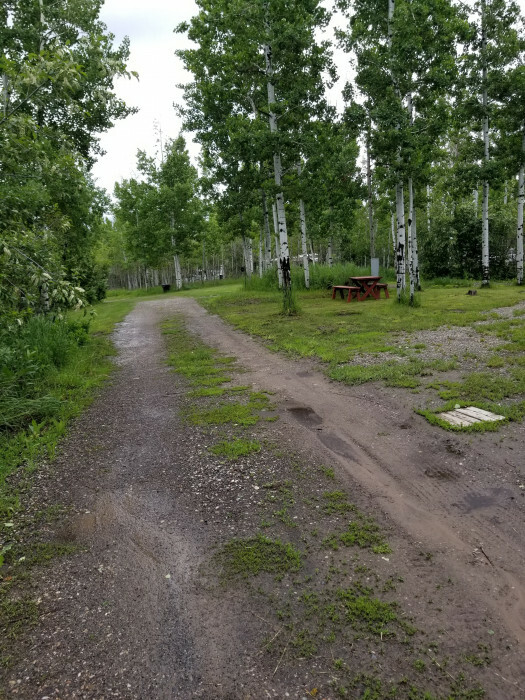 There are aspen trees and other types of trees throughout the campground. It is peaceful, sites feel roomier than most but location is a bit out of the way. There is only one washer and dryer so we used the laundromat in Ashton. We camped at Yellowstone Golf Resort in a Travel Trailer. Restaurants with outdoor seating that allow dogs and face the Snake River (Angler's Inn & Last Chance Grill in TroutHunter Lodge). Don't miss Johnny Sack's Cabin in Big Springs. Cabin and furniture all hand built. Check hours cabin is open to view. 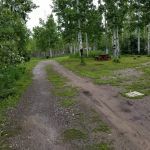 Walk on the paved trail to the far right as you face the cabin across the water; the trail leads into the woods but curves around quickly to the cabin. A must see! Very cool. Mesa Falls are also worth driving to...Upper and Lower. We absolutely loved this place! Pulled in thinking we would stay a week, and stayed a month! We are from Texas, so obviously it is a long way from home, but we will be going back there! The sites are large and tucked away in an Aspen grove. Views of the wheat fields are there for the taking. So quiet at night, it was heavenly. Beautiful night skies to take in too! Gorgeous!!!! There is a really pretty golf course on premise that is so affordable. It's a fairly new addition and they work on it constantly. One more year and it will be pristine! The owners are super nice and the manager is a gem! We felt so at home here and it had a lot to do with her. The place wouldn't be the same without her. Can't say enough good about it. We camped at Yellowstone Golf Resort in a Travel Trailer. Certainly not adequate for a 45' motorhome. Some sites had gravel, ours had none. Our leveling pads sunk into soft soil, and we were unable to level the coach. We had to leave one day early because of rain forecast. Rain would have severely endangered our ability to extract our coach. Sites may be okay for smaller rigs, but definitely not bigger ones. Golf course was a real joke. Greens were basically just a flat space mowed shorter that the 3" long "fairways". Green fees were what you would expect to pay for a normal course. Definitely will not return. We camped at Yellowstone Golf Resort in a Motorhome. Rolling wheat and hay fields in all directions. 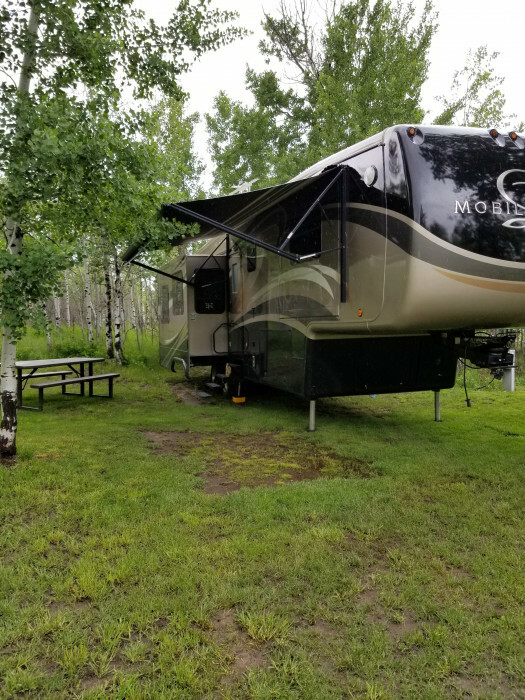 RV sites were situated within an aspen grove, which provided shade but inhibited satellite reception. Very little phone service for AT&T. If you want remote, this is it. 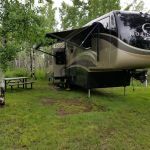 It is difficult to rate this campground: lovely sites and not so lovely weekend price. The setting is beautiful with private sites in a splendid aspen forest. It looks similar to a state or national park but with full hook ups! We would stay longer if it wasn't so overpriced- $50 a night weekend rate far away from any major attractions or from the very small town of Ashton. Unfortunately PA was only accepted on one weeknight. It has definitely been allowed to rundown by the past owners, but can tell that the new owners are working to update roads, sites and facilities. The laundry has one washer and dryer in a cute red shed that was under repair when we were there. Except for the well groomed golf course though, it is not a resort! While the park is a good distance from Highway 20 and Ashton through rolling fields, it was well worth the trip for the beautiful wooded setting. We camped at Yellowstone Golf Resort in a Motorhome. Ashton in a nice small town with a Family dollar, gas stations and a few restaurants. They had the best, most complete small town grocery store that I have ever been in. Daves is located with a Chevon gas station on highway 20 right before the turn into Ashton. This might be my favorite RV park yet. Most sites are nestled in a picturesque Aspen forest. Many sites are hidden from their neighbors by the trees. This morning a doe and two fawns wondered thru our site. Weekdays the park is mostly deserted; and even when it fills up on weekends, it remains quiet and peaceful. They have a par 3 golf course, which is seldom crowded, so you're not rushed from hole to hole. There is no WiFi, but we had excellent AT&T and Verizon service. We had no problem streaming Netflix. There are no street lights in the park. Night is pitch black unless the moon is out. The stars are magnificent. Yellowstone Park is an hour away. There is a Walmart 30 minutes South in Rexburg. The new owners are working hard to make this a great RV park. It is now called the Yellowstone Golf and RV Resort. We hope to be back many times. All sites either had a fire ring, or cinder block fireplaces. We camped at Yellowstone Golf Resort in a Fifth Wheel. Walmart and Albertson's in Rexburg, 30 minutes south. Sam's Club and shopping Malls in Idaho Falls, one hour south. This was a great place to stay to get away from crowds and enjoy some peace and quiet. We travel fulltime and spend a lot of time at national parks and other highly populated areas. Sometimes it's nice to get away to a quiet park like this to enjoy some down time. People do visit Grand Tetons and Yellowstone from here, but we already had plans to go to both of those and stay closer, so this was just a chance for us to catch up on work and relax before we got to those more crowded parks. While we were there we enjoyed dinner at Five 11 Main which I believe is owned by the same people that run the RV park. Very good restaurant! I would highly recommend it. 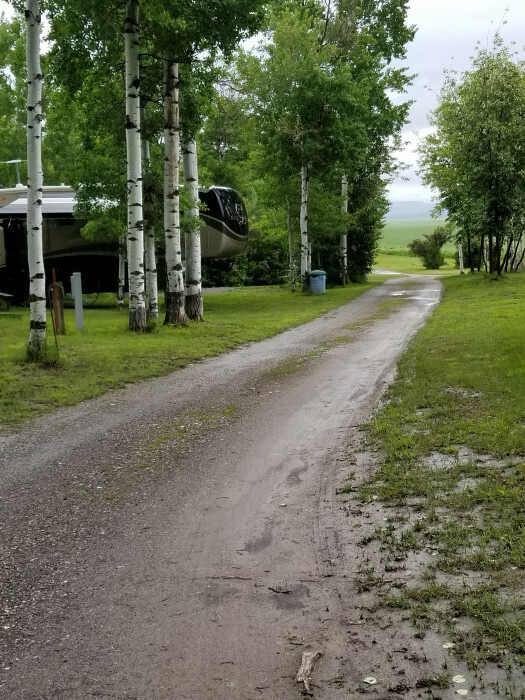 The RV park is a little tight getting into, and some sites are small and hard to get into because of the trees. We have a 41 foot 5th wheel and it took some maneuvering to get into our site so that all 5 slides could go out. But once we were in, we had plenty of room and really enjoyed having the trees for the shade. Verizon 4G worked well here which is important for us since we work remotely. And they let me have a package delivered here which I appreciated as well. We really enjoyed our stay here, and the people that run it are nice and friendly. One word of caution, our GPS took us down several miles of dirt roads that we probably shouldn't have been driving down with our house behind us, but once we were on those roads there was no way to turn around. There are paved roads to get to this park that we found out about later. Call the park ahead of time and ask for better directions than what GPS might tell you to do. At least they let us wash our RV while we there which was nice since it had gotten so dirty on the dirt roads. We camped at Yellowstone Golf Resort in a Fifth Wheel. What a great little find. Small little campground, very clean, well kept, and super nice people working here. They really went out of their way when we got here. Will definitely come back again! We camped at Yellowstone Golf Resort in a Fifth Wheel. This is a small gem located about 1 hour from West Yellowstone. Nightly rate was averaged for 6 nights. Passport America was good for 4 of those nights. Very quiet park out in the boonies. NOT big rig friendly. Tree branches and narrow entry road are not good for Class A or fifth wheels. 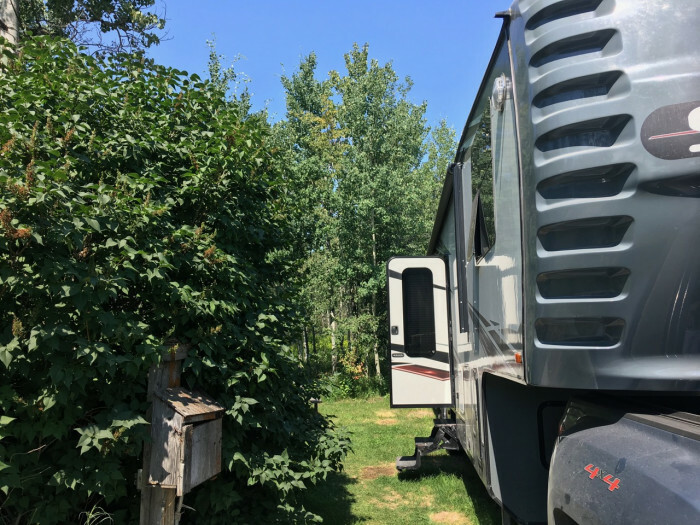 There are a few sites at the front of the camp ground that could fit a big rig, but once you get into the trees, good luck. You'll probably get new scratches on the roof and top sides of your coach. I think they should cut down a few of the trees in the camp area. Would make it easier to get rigs in and out plus add openness to the sites. There would still be plenty of aspens left. Water pressure was a meager 22 psi. Don't know if that is because they water the golf course all day or not. Park's wifi connectivity is a complete joke. One hot spot and very slow connection. Would be better to not have it instead of disappointing the customers with slow speeds and frequent drops. No off leash dog run. There is ample room to put one if they ever decide to. If you like to golf, you might enjoy this place with it's 18 hole executive golf course. No cable and no over the air tv. Satellite might be a problem if you have a well treed site.This park is about an hour from West Yellowstone and about 2 hrs from the south entrance to the Grand Tetons. You can see the Tetons in the distance from the park. I stayed here for the PA rate. Probably should have bit the bullet and paid more to stay at a park closer to Yellowstone. At least some of the money I saved staying here was eaten up in fuel costs driving to/from the parks. We camped at Yellowstone Golf Resort in a Fifth Wheel. Cave Falls is about 20 miles away on a side road. 11 of those miles are on a gravel road. Mesa Falls is nice and about 12 miles away on Rt 47. Idaho Falls is about an hr away. Stores downtown are closed on Sunday. The Mexican restaurant in Ashton has good food, big portions and very reasonable prices. Tourist info center in Ashton has a lot of good info on the area and beyond. The Fort Henry Scenic Byway has several miles of gravel road. 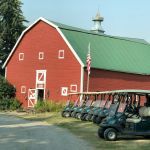 If you like golf or just want some solitude, you might want to check out this RV Park in northeastern Idaho, somewhat near to Yellowstone and Grand Teton Parks. 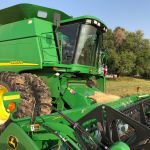 As you drive east from the small town of Ashton, ID, you drive through wheat fields and take several turns on narrow farm roads. Then eventually, you reach an oasis of aspen trees on a hill. You reach the RV Park by driving through a portion of the golf course. The sites are grass/dirt among the trees and most afford lots of shade. The hookups include 50 amp service, water and sewer. There are basic restrooms/showers, a small laundry and WiFi that is available in one spot. Definitely quiet with lovely views all around. With the Passport America discount, it's a good price. We camped at Yellowstone Golf Resort in a Motorhome. On a golf course. Otherwise, nothing else around. Are you affiliated with Yellowstone Golf Resort ?